It was a stroke of luck that, on our very last day in Jogja, Singapore artist Jimmy Ong (now resident in Jogja) suggested that we squeeze in a visit to the very cool creative space that is Lir, before we proceeded to the airport to catch our flight home. Typically, as all good Singaporeans do, we were eating a huge lunch (at Bu Ageng, which is featured in our Jogja Travelog II) and talking about food at the same time – great meals we’d had in the past, good places we were planning to eat at in the future. It was therefore quite natural that this should bring to Jimmy’s mind an exhibition that was running at Lir Space that centered around food. Intrigued by his description of both Lir and the performance piece in question, we set out to find this place. With the help of our driver and the ever-trusty Google Maps, we found it tucked away in a quiet residential area in the part of Jogja known as Baciro. You’d have to look carefully to make it out as it looks, from the outside, like just another cosy home and not the art gallery-library-curiosity shop-restaurant-creative space that it, in fact, is. 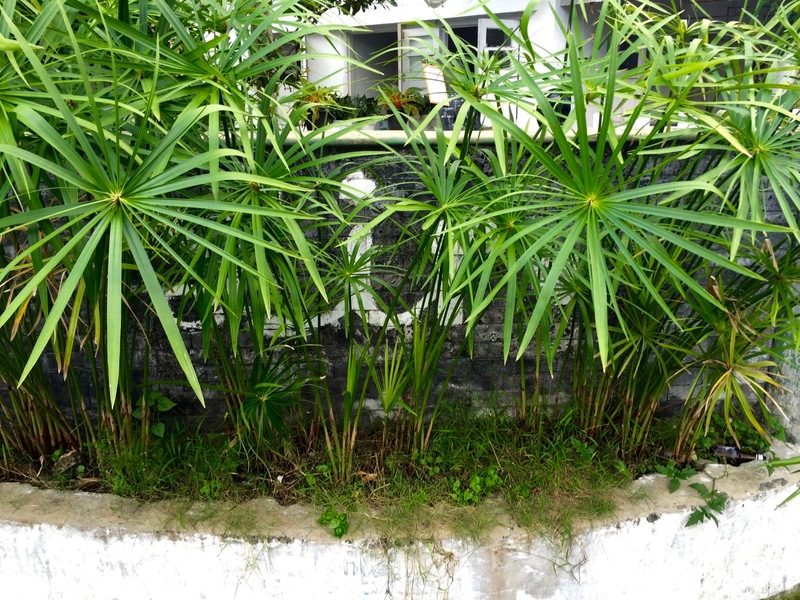 We had to look carefully behind the lovely foliage to spot the handpainted sign that says Lir. Dito Yuwono, one of the 2 co-founders of Lir (the other is Mira Asriningtyas, whom we did not have the pleasure of meeting that day) very kindly showed us around the place and told us a little bit about what they were doing. The exhibition that we had come to see was part of the On the Table project showing at Lir at the time. The Observant Club’s Fine (Art) Dining was a performative exhibition, referencing several important artworks in Indonesia’s art history, and re-presented in the form of a participative dining experience with a 3-course meal and beverage. Yes, a number of lucky guests got to eat, and drink, the art, so to speak! We weren’t fortunate enough to actually enjoy a meal at Lir that day, but were nonetheless fascinated by the video archives and other documentation of the exhibition that were on display. The entree, frog’s legs, references Dutch-born Indonesian resident artist Mella Jaarsma‘s 1998 performance work Pribumi (which means “son of the soil” or indigenous person), where she invited seven “foreigners” to cook and serve stir-fried frogs’ legs or swikee, a Chinese delicacy, considered unclean or haram by the local Javanese-Muslims, to passers-by. This performance took place on 3 July 1998 on Malioboro Street, in front of the presidential Palace in Yogyakarta, in the wake of violent racial riots during which many ethnic Chinese were killed. Watch scenes from the performance and the artist explaining the conceptual idea behind the work, in the video below. In the performance at Lir the main course, which references Agung Kurniawan’s work, was served on dishes like this one. 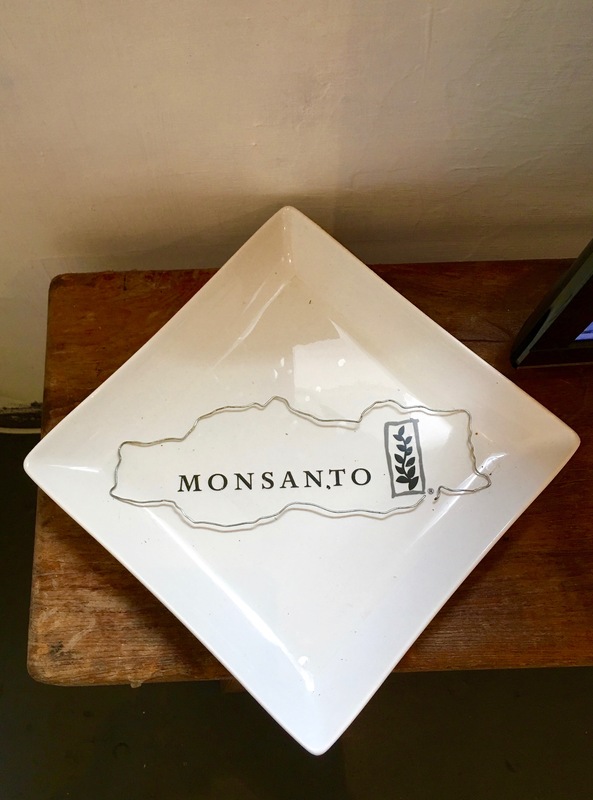 Who/what is Monsanto? Find out here. 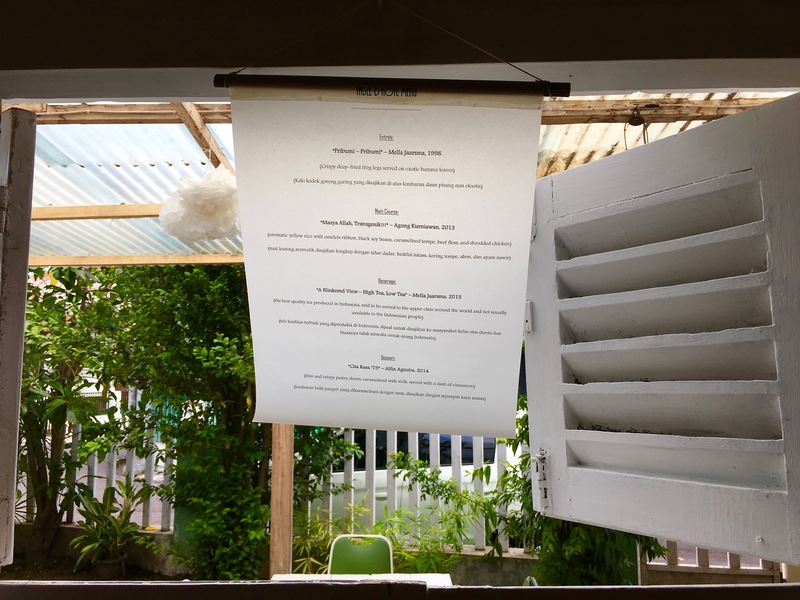 One of Mella Jaarsma’s more recent works, from 2013, A Blinkered View – High Tea, Low Tea, was the basis for the beverage which was served with the meal in Fine (Art) Dining. The best quality tea that is produced in Indonesia is reserved exclusively for export to be sold to the upper class around the world and is not available to Indonesians. However, it was made available and served during the performance at Lir. The original work was created by the artist for an exhibition at the Museum Van Loon in Amsterdam, Suspended Histories, where eleven artists were invited to reflect on Dutch colonial history and, in particular the role that the Van Loon family played in the Dutch East India Company (Willem Van Loon co-founded the Vereenigde Oost-Indische Compagnie, VOC in 1602). 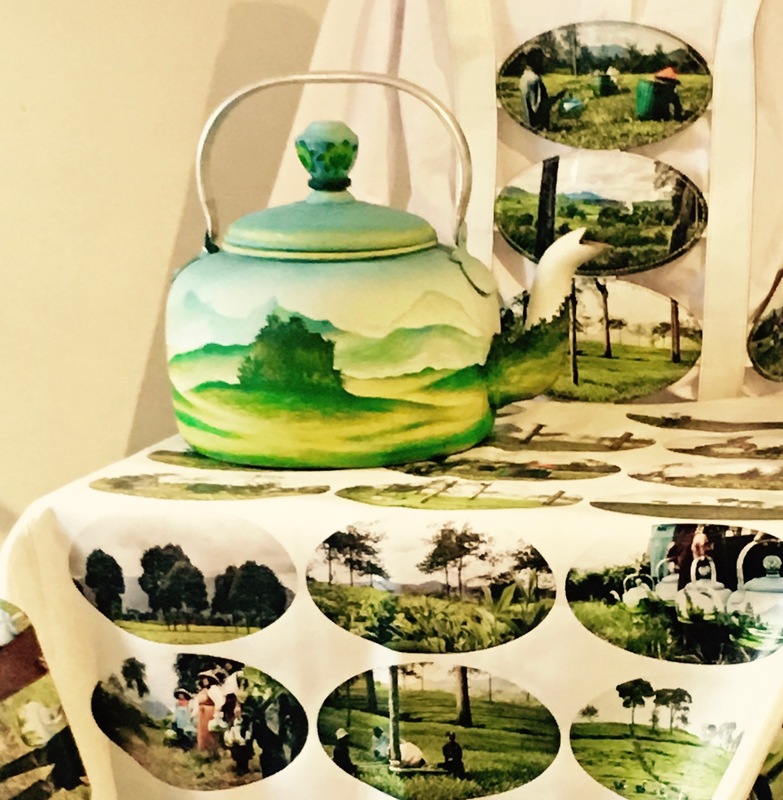 The romantic ‘Mooi Indie’ style landscapes painted on aluminium kettles like this one were made by artist Anex, who is from Jatiwangi, a region in West Java that is known for its tea plantations. The romantic imagery references the landscape painting traditions of the colonial era while also alluding to the unromantic cruelties of daily life that took place during this period. The work examines the power relations between coloniser and the colonised, ruler and subject, master and servant, and how these borders are blurred or reversed. There’s a whole lot more to this multifaceted work than is possible to describe in this post – if you are interested, more information is available from the artist’s website. Finally … dessert! Here, the idea was not only to eat the art but also to consume important ideas about art in the process. Artist Alfin Agnuba first created his solo exhibition, Citarasa ’75 (Taste ’75) at Lir Space in 2014. 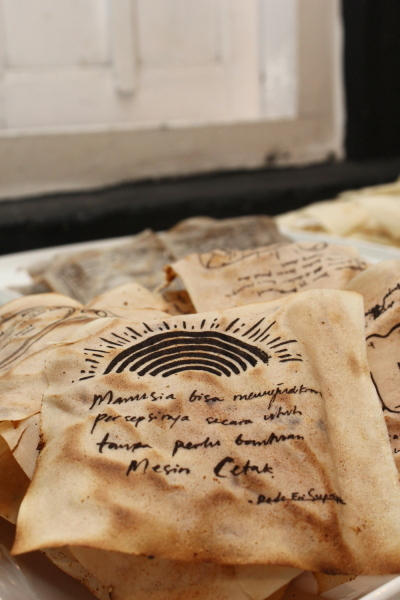 As part of the exhibition, he made edible pastry sheets with silkscreened quotations from essays written by members of an important (trust us, very important) Indonesian artists’ group from the 70’s, Gerakan Seni Rupa Baru Indonesia (GSRBI, for short – the New Indonesian Visual Art Movement). Flavoured with milk and cinnamon, these tasty pastry sheets were the artist’s way of delivering “instant knowledge” about the GSRBI and their ideas through having people consume the quotes from their essays. So – there you have it – Lir Space’s witty and delicious attempt to present a short timeline of Indonesian art history – through food and drink. What could be more appealing to art enthusiasts like us, who also happen to be avid foodies? As an aside, Singaporean artists (but of course!) have also presented performance and interactive installation works that involve the preparation, cooking and eating of food in participatory settings, in particular, Amanda Heng’s 1996 piece, Let’s Chat (peeling taugeh) and Matthew Ngui’s You can order and eat delicious popiah (1997), to name but two. But that, my friends, is stuff for another post! You can find Lir Space at: Jl.Anggrek 1/33, Baciro,Yogyakarta, Indonesia. I really enjoyed learning about the food art presented here. Food has so many dimensions…and it literally becomes part of us. Those who eat it, I mean….